Click on one of the above titles to head straight to the review. The County Waterford-born singer Karan Casey originally made her name with Solas, her silkily pure vocals providing a lissom and integral counterpart to the band’s sometimes frenetic approach to traditional music. Her debut album, 1997’s Songlines was recorded while she was still a Solas member and it was only with its successor, The Winds Begin to Sing, released four years’ later, that she really set forth on her solo career. The Winds was produced by Capercaillie’s Donald Shaw and consisted predominantly of traditional songs, though Karan returned to her jazz inclinations with Strange Fruit, while also employing the writing talents of the pairing known as “The Gaelic Hit Factory”, John Spillane and Louis de Paor. Distant Shore functions on almost identical principles, except this time the traditional ditties take a back seat in favour of songs from the likes of Billy Bragg (the title track) and the Irish songwriters Ger Wolfe, Matt McGinn and, again, the “Hit Factory”. Now therein danger lies since Karan made a name for herself as a remarkable interpreter of traditional songs, suiting her somewhat fragile tones to the material. This approach remains effective on Mary Brookbank’s The Jute Mill Song, but when she sings the chorus line of Ewan MacColl’s The Ballad of Tim Evans, it’s difficult to believe that she really means “Go down, you murderer, go down”. Nevertheless, solid musicianship from participants such as fiddler Dezi Donnelly, banjo-player Dirk Powell and concertina-player Niall Vallely, married to exceptionally sensitive production guarantees Distant Shore’s overall success. However, in choosing to sing Lord MacDonald’s in Scots Gaelic as a duet with Karen Matheson there is a lingering sense that Karan Casey might just have sailed a little too close to the Capercaillie wind. Karan Casey doesn’t just wear her heart on her sleeve, rather it sits there throbbing and pounding, suffusing her songs with a vigorous, blood-red sense of purpose. The woman from County Waterford with the golden voice has so far produced three previous impressive solo albums, not counting her work with Solas, but Chasing the Sun represents a massive leap forward. It’s not just the finely-tuned settings of Karan’s voice against the sparse backdrop of guitar, bouzouki or mandolin, supported by Ewen Vernall’s utterly understated bass-playing which puts this album on a higher level than her previous releases. There’s the subtle injections of Niall Vallely’s concertina for starters and a sensitive use of overdubbed vocal harmonies. 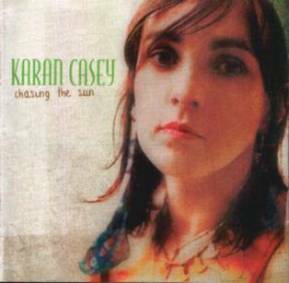 Rather, and key to it all, far more than any of its predecessors, Chasing the Sun successfully marries a mix of traditional, but ever lyrically-pointed, songs, such as the epic unaccompanied ballad Jimmy Whelan, with contemporary material that reflects Karan’s rising status as one of Ireland’s most politically-charged singers. Her own compositions reveal increasing confidence and incisive political awareness, not least in When Will We All Be Free, which attacks Ireland’s current policies on immigration. Above all, however, the songs are invigorated by her gorgeous, sensual, utterly knowing voice. 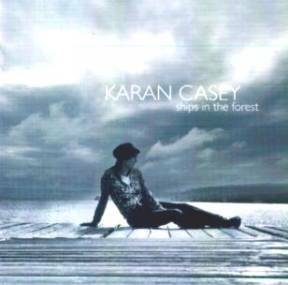 Something has gone terribly awry in the musical world of the Waterford-born singer Karan Casey. In returning to some of the ‘big’ songs of the Irish tradition, the strengths she previously drew from that heritage have been dissipated by a production style which seeks to conjure emotion via sparseness, yet often drifts into vacuity. 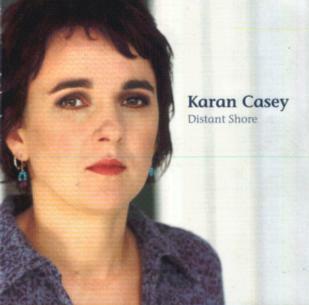 As ever it’s impossible to deny Karan’s vocal excellence, while the standard of musicianship is admirable throughout and features the three Vallely brothers on piano, concertina and uilleann pipes, as well as guitarists Robbie Overson and Kris Drever, cellist Kate Ellis, bodhránista Martin O’Neill, and producer Donald Shaw on accordion and keyboards. However, unlike previous albums, Karan’s sweet-as-honeydew voice is offered little scope to explore sentiments outside the gamut of dolour, doom and deprivation. Love is pleasing is one of the great oxymoronic traditional song titles. Poor Johnny loses his legs in Johnny I Hardly Knew Ye, Erin’s Lovely Home is a tongue-in-cheek-titled torrent of the emigrant’s woes and I Once Loved a Lass offers an unrequited suitor the chance of live-burial. Moreover, even the two contemporary songs on the album, Joni Mitchell’s The Fiddle and the Drum and Martin Furey’s Town of Athlone, are both death-focussed, albeit from international and local aspects respectively. Featuring songs as familiar as Black is the Colour and I Once Loved a Lass suggests that Karan’s inspirational well might be nearing dehydration while listening to this album repeatedly will almost certainly drive you to drink. All three reviews by Geoff Wallis were originally written for Songlines magazine – www.songlines.co.uk. For more information about Vertical Records visit www.verticalrecords.co.uk.